How to schedule a recording task? Selecting the appropriate settings here, then Enable the task, then click 'OK' or 'Apply' to make it take effect. 1) Make sure you have selected the appropriate recording device. Do some test recording and see if it is recording properly. 2) Do some test on Schedule function, make sure that you set it correctly. For example, set it up to start on the next minute, and stop on several minutes later. 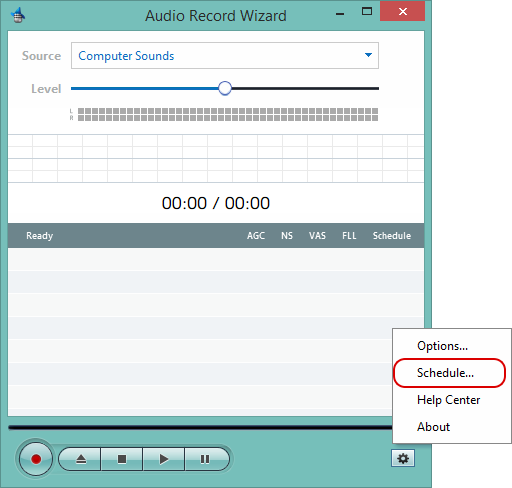 3) Keep Audio Record Wizard open when you leave, Audio Record Wizard can not open itself. Also, make sure that the computer will not sleep/hibernate during the specified time. 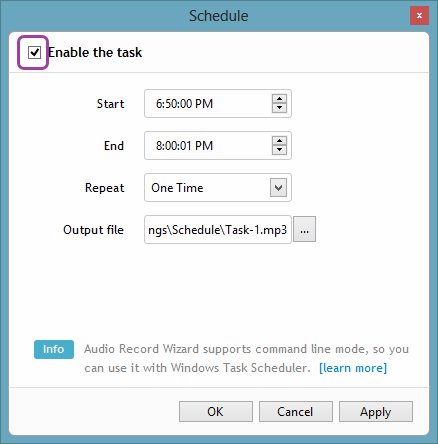 Audio Record Wizard supports command line mode, so you can use it with Windows Task Scheduler. Learn more about this.